Though the tropics offers a complex set of problems, it also provides abundance in cottage industries and responses to all of the factors outlined in the intro part from myself based off of my experience and Mollison’s opening intro on “life” in the equatorial regions. These, as well as others, can be leveraged to make life easier but require attention to detail. Turning those into economic opportunities are great ways to make life more thrivable. This page, and the others that follow, detail the cottage industries that can be set up to sustain projects and diffuse quality products and services. While some are innovative, some are greener options for standard industries like tourism. Inherently in all tropical adventures fruit is sure to be one of the pure delights for us northerners. So production of fruit is part of subsistence and integrated systems but also can be a cottage industry. Other common fruit production includes staple fruits like the myriad of banana cultivars and also the cultivars of the breadfruit/ bread nut. Bananas can be grown in the wildly popular design of banana circles which is explained more here if you click here. Whether it’s eating them raw with the normal banana or cooking with the quadrado or frying the plantano, there are more varieties out there than just what we find at the supermarket. I have also purchased at shops the uniquely flavored banana vinegar. Many fruits in the tropics can easily be fermented into vinegar, which is great for putting on raw foods to flavor and sterilize them. Using vinegar as a cleaning and personal hair care product is also expanding so their maybe application there. Furthermore, Breadfruit is a common staple that is fried in coconut oil and a pretty hearty meal and quite nutritious. i had the pleasure of catching the tail end of the season in the Dominican Republic in 2013 and we ate quite a bit in this short period from buying from local farmers. The other cultivar is the breadnut, which I processed and ate a lot of in Costa Rica (2005-2006). You take the mealy fruit apart to reveal chestnut like nuts which you boil in salt water for 25 minutes and voila, you have a starchy nut resource to keep you going! 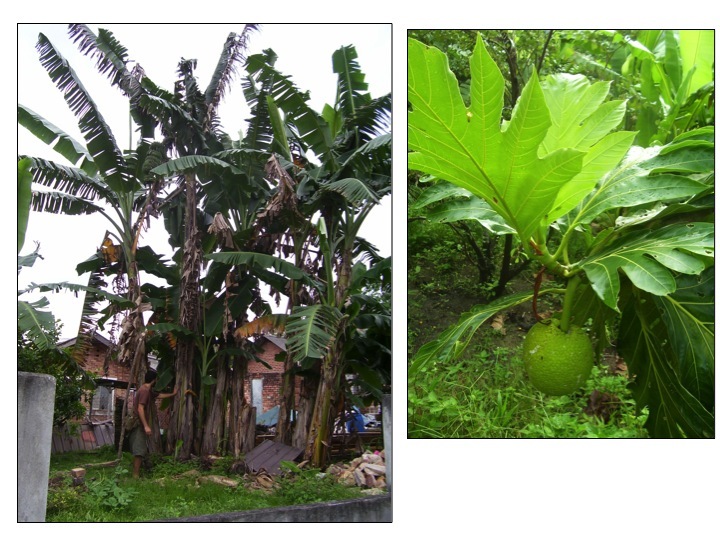 Both the banana and breadfruit are sold at markets as staples and can be apart of the farms yearly plan to obtain a financial yield. Another staple fruit commonly seen at markets is Durian on the right slide above. It is considered the king of all fruits, with its warming, sulphury taste yet extremely nutritious as well. If you get to try this fruit don’t be put off by the strange taste and smell, keep trying it!!!! By the third time you eat it you will be hooked and happy to buy them at markets or seek them out on production farms. Those who love it are happy to pay a premium price for really good ones which when grown the permaculture way is likely to happen. Another staple in the tropics of course comes from the coconut seen above left. What a treat; oily and fleshy is its seed, yet while young a delectable drink that is super hydrating. And it grows on the edge of the ocean in pure sand, salt, sun and powerful winds. It can be processed several ways including raw coconut oil which I took part of in Costa Rica. It was hard work but the finished product was incredible and fetched a fair price to passerby tourists hungry for some naturally processed coconut products. We would also buy fresh coconuts at the market in Malaysia and they would grind it right there on site. We would always ask them to put it back in the coconut to transport it on our walk home rather than the two plastic bags they normally would give. Between that and eating it raw on the walk home, we became the talk of the town. 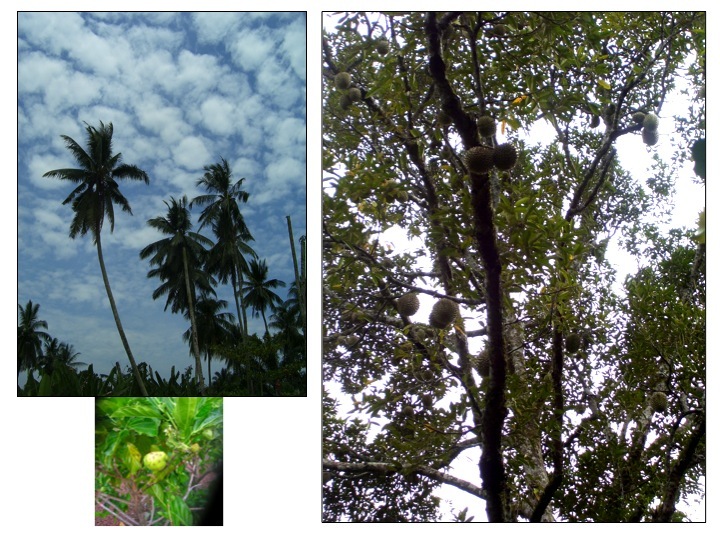 Furthermore, on the above slide below left there is noni fruit or Indian Mulberry. It is not the worlds best tasting fruit but used more medicinally than anything else. One can ferment into a juice and sell that as a processed food. I drank some at a project in the south of Costa Rica and enjoyed it very much despite my nickname for it being stinky sock juice. I enjoyed the nutrition, not the flavor, which is important in keeping our bodies healthy in the tropics. This slide above represents just the amazing amount of biodiversity that there is in the tropics and all the fruits that come locally with that. The one on the top right I don’t even remember the name from it anymore but when I was in Malaysia in 2009 I had eaten it pickled. 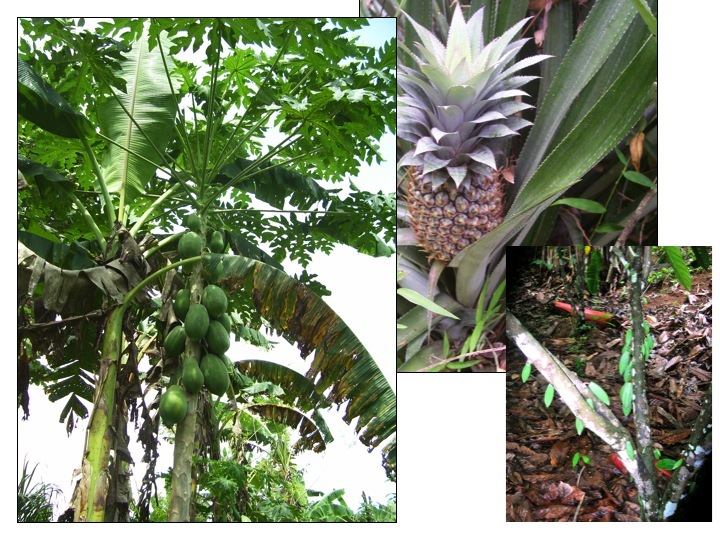 On the top left, dragonfruit is becoming a more widely grown fruit especially in the highlands. 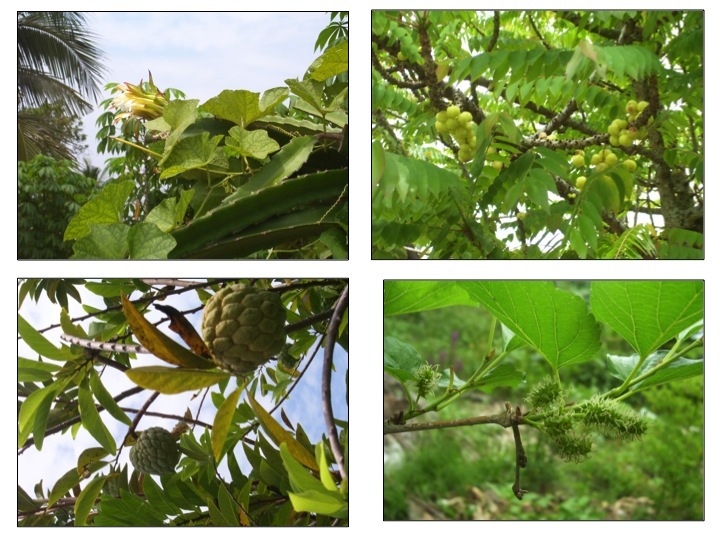 Bottom left is a type of Annona which is one of the true delights of the tropics as that family has quite a few selections there. And on the bottom right is the mulberry and shows the diversity of this fruit as it seems to grow everywhere in the world! Annona’s and dragonfruit are commonly seen at markets while the other two represent more of a niche market or in house consumption. valued at markets and this picture is from our small plantation of them in Costa Rica. These were unique in that they weren’t yellow inside, rather it was white which would also fetch a premium along with being grown organically. This variety was incredibly sweet and we even made alcohol and then vinegar by default in the end as we didn’t have the true proper equipment. The last one on the right seems to always stump students of what it is yet it is such a ubiquitously eaten fruit. Inside is the most delicious white candy floss fruit which wraps around the bean within. The bean is purple and brain like in its appearance. It’s extremely bitter yet we love it; Cacao. I know a few permaculturists who have taken on making this a local and commercial product and I know we sure enjoyed it while in Costa Rica! owned land, the whole mountain, includingat the bottom of the hill near the entrance which became the farm site. They desired a farm because they had land and were tired of paying too much for low quality produce. Thus I was hired to do a quick design and work with a crew of 20-30 Dominicans and Haitians and a series of machines and trucks to build the farm in a period of about two and a half weeks. We implemented spaces for vegetable production, staple production, and plantain circles because the Plaintain was one of their main inputs of the kitchen. We also made it very aesthetically pleasing with ponds, water harvesting features to take care of runoff, and think about how tours and education could be integrated in the space in the future. I have also seen in other projects this focus of supplying the restaurant with their own produce. This cycles energy in the project by giving a direct market to things that were being grown thus creating a value added opportunity. This model helps bring employment and viability to a project and thankfully is a growing trend. It allows for a quality control to occur and freshness factor come through to the cuisine as well. Tourism often follows with this model and that was our plan at this project in the Dominican Republic with an elevated canopy walking tour by connecting bridges from the already existing palm trees and building infrastructure on the edge. The machine being operated by a fantastic operator. Working on a swale connected to a pond to deal with a water flow on the land. From the restaraunt looking down towards the majority of the work having been accomplished. the after pic. Another vastly productive system that allows delicacies and income to be procured is aquaculture. With Bill Mollison saying that this is 4-20 times more productive that your adjacent land based systems, there is no better argument needed. If the soils and context are in alignment, digging to harness water yields is vital. Waterways yield in multiples with fish of all sorts, prawn, edible aquatic plants, and water fowl all being viable yields. Polyculture is encouraged and easily incorporated. Systems thrive through these interconnections but ease of harvest always needs to be a design feature. It is a system that needs interaction in the tropics because of its abundance but the time and energy again is minimal until harvest time. 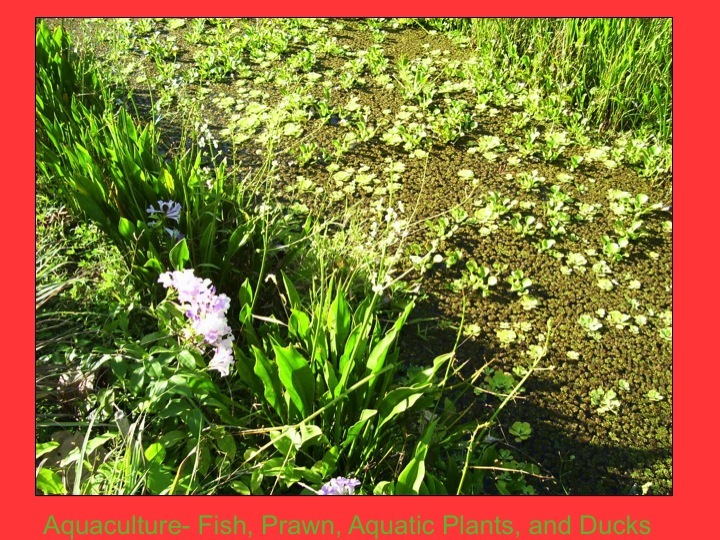 Nurseries of aquatic plants are possible as well as the production of other creatures who thrive in these cultivated ecosystems from ducks, to fish, to prawn and more. Another product for sale or lessening of outside inputs is the processing of fibers into useable products. In the picture below coco coir is seen in three of the pictures producing cordage for agriculture use, construction, and furniture. 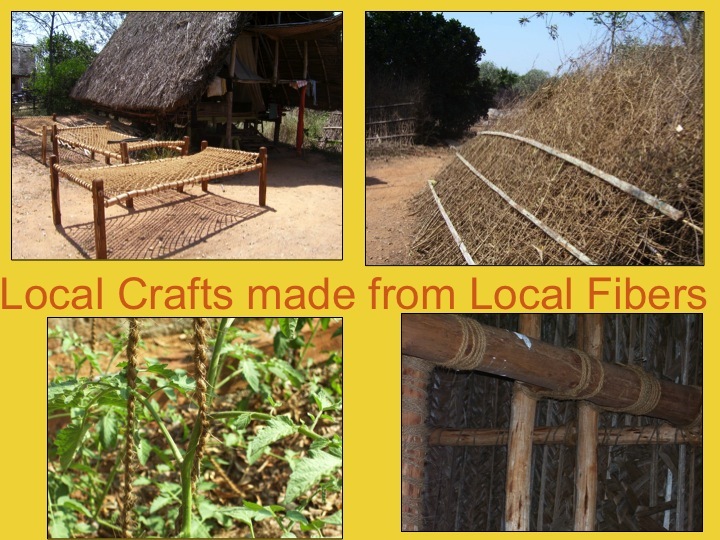 These all are necessary in homesteading and with the right technique and raw materials, fiber production of all sorts can be proactively engaged and subsequent sales of the surplus. Also in the picture below on top right, spiky, dry hardy bamboos were used to make fencing. These are easily set up to keep sectors at bay and rather than relying on vast uses of industrial metal a tiny fraction was used in the construction of the panels. They simply held everything together but this type of fencing is low-cost but does require labor, skill and raw material to construct them. The material can be replaced overtime but some systems only need temporary fencing before wild animals can take advantage of reforested areas. Finally, other local delicacies are grown for a premium price. In India again in 2009, I came across the hibiscus family plant Rosella being processed in large quantities by Indian woman. Its tart flavor full of vitamins is balanced with sugar to make a local jam for flavor enhancing to meals. It is easily grown and its processing is relatively easy but does require space, attention to detail, and patience for the curing process. 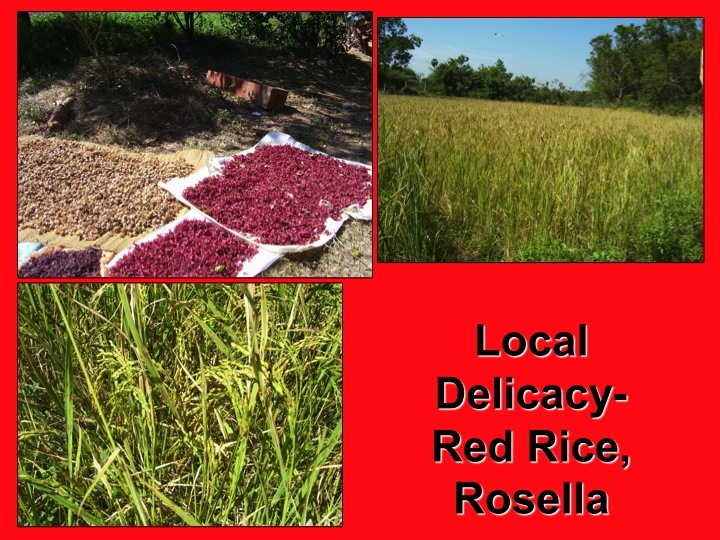 Also I saw red rice being grown, a local variety with superior nutrition and flavor. Again its yields proved to be a worthwhile venture for the farmer that was inspired by Fukoaka’s techniques of growing grain. In conclusion, a combination, or a multi element approach should be taken towards this cottage industry approach to reduce expenditures and infuse projects with capital.